Hi Its Debra and today I will cover why its not smart to put a standard wall mount magnifying mirror in your show. There have been a lot of instances where people who don’t really think about it and mount their mirror on the wall inside the shower cubicle. Hot water spraying in the wrong direction can make the glass crack and fall out. Sometimes it’s easy to slip in the shower and your natural reflex will have you reaching for something to stop yourself falling, it’s very easy to break the glass and have it hitting you some where on the body. A nasty dangerous blood loss can be the result. The standard magnifying mirrors are not made to be covered in water and steam – they rust very quickly as most mirrors are manufactured with steel and then chrome plated. Please only ever put a magnifying mirror that’s designed and designated for use in your shower cubicle. A true shower mirror does not use glass they use mostly poly carbonate which does not shatter when it’s dropped. Add to that the surface of the mirror is treated to prevent it fogging up, something the standard mirror cannot do. 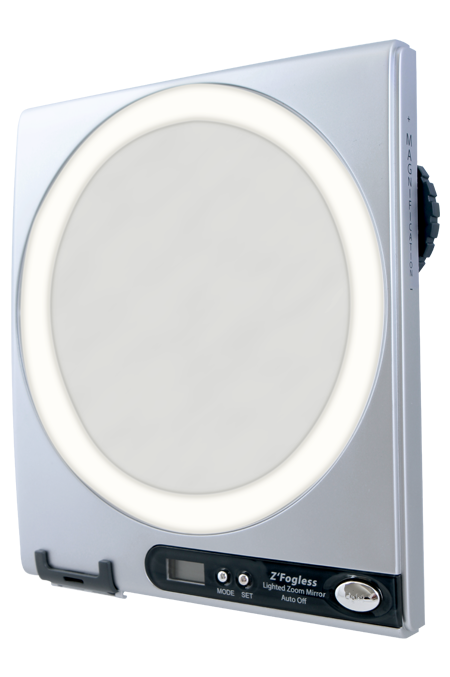 Our fantastic Zadro fogless lighted magnified shower mirror is perfect for the job. The Z’Fogless™ Adjustable Magnification LED Lighted Mirror features a patented hydrophobic coating to repel water and keep it completely fog-free no matter how steamy the environment. Plus, its unique adjustable magnification control cycles between 1X and 5X simply by rotating the mirror head. The 1X magnification is great for all-around viewing needs while the 5X magnification is perfect for getting up close and personal when shaving smaller, sensitive areas of your face. The perfect shave requires the perfect conditions. Dermatologists recommend shaving, cleansing, and exfoliating your skin in the shower. The hot water and steam allows your hair and skin to soften so that the razor can shave more efficiently avoiding that painful tugging, pulling, and razor burn. No matter how dim the environment, the LED surround light evenly illuminates your face for a fuller, brighter reflection. Built into this brilliant shower mirror is a place to hang your razor, LCD clock so your not late for work. Best of all it easily mounts to most any smooth surface via suction cups, hanging cord, or double-sided tape which is included in the mounting kit. The shower water will not affect the stylish sleek silver finish. Having a mirror such this Zadro z850 fogless mirror is a much better option that putting a standard magnifying mirror in the shower. You have a light which the standard one does not, it will not break if it falls down, A place to hang the razor and see the time is just the best thing when you’re in a hurry. Best part is the z850 cost less to buy than the standard magnifying mirror. In a perfect environment, the fogless mirror should stay fogless forever. However, external factors such as hard water build-up, airborne oils can reduce the “fogless” effect. To revert your mirror back to an “out of the box” state, clean the mirror surface with a non-ammonia cleaner, like our Z’Fogless Spray a non-abrasive cloth. Do not clean the mirror with Windex or any other ammonia based cleaner, as it will destroy the “fogless” coating on the mirror.